During Sega’s heyday, there was an immense amount of talent churning out hit after hit. From Sonic Team to the Sega Technical Institute, there was no shortage of creative minds to turn to for the next big game. All of those great products needed sounds and music, and Sega even had that base covered. The Sega Multimedia Studio was a group of in-house technicians and composers who scored and did sound design on many of the company’s biggest games, including Ecco the Dolphin, Jurassic Park, and Spider-Man vs. the Kingpin. Sega poured hundreds of thousands of dollars into the studio, equipping it with all the latest technology, and the team was at the forefront of incorporating things like surround sound and QSound into their CD games. Among the group, which included Spencer Nilsen, was Brian Coburn. Working at the Multimedia Studio for five years, Coburn was involved with several Sega titles during the Genesis era. With years of experience in the field of music (he currently engineers and produces the Internet’s first virtual band, the Bots) Coburn spent a great deal of time creating sound effects and music on the Genesis and the Sega CD. We recently got a chance to chat for a spell about his time at the Multimedia Studio. Sega-16: What was your position at Sega of America? 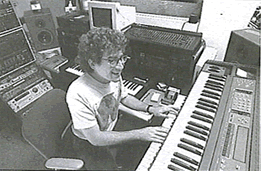 Brian Coburn: I was a sound designer and composer at Sega from 1992 to 1997. Sega-16: We’ve heard about the creative freedom Sega gave the designers at the Sega Technical Institute. How much freedom and support did Sega give the Multimedia Studio? Brian Coburn: I think Sega was ambivalent about the Multimedia Studio. They weren’t sure what to do with it or how to make it effective. One issue was whether the studio should develop only for Sega platforms, or whether we should also try to leverage content onto the platforms of our competitors as well. Sega-16: CD technology, as used in video games, was still in its infancy when the Sega CD was released. How difficult was it to find or create the necessary tools for working on it? Brian Coburn: We worked closely with leading developers of game-related technologies. For instance, we used QSound other 3D audio technologies when they were just getting off the ground in the early ’90s. In order to pan sounds in QSound, we had a large rolling cube that contained multiple computers and custom audio processors with a custom pc mounted on the top and a joystick controller. We would wheel this thing around between our different studios and patch it into our protools systems when we were mixing 3D spatialized sounds for the game. Sega-16: How did you get involved with Jurassic Park CD? Brian Coburn: I was the main sound designer for the Multimedia Studio, and when the project came along, I was offered the opportunity to work on it. Sega-16: Was the Sega CD team separate from the cartridge one, or did they overlap? Brian Coburn: Two different teams, I think the cartridge was created by BlueSky. They may have used some of my sounds, but I was not involved with the cartridge project. Sega-16: You’ve mentioned that you were nearly attacked by an alligator while recording the sounds used for the T-Rex roar. What happened? Brian Coburn: We went to the Okeefenokee swamp in Georgia where I was trying to make close proximity recordings of angry alligators. I got them. We tracked down and cornered alligators in the swamp to try to get them angry so that they would hiss. We were cocky and deliberately aggravated the alligators to get a more dramatic response. I had several incidents where startled, disturbed and angry alligators came at me or snapped and lashed out when they felt cornered at very close proximity. One day we were charged by a puffed-up, hissing gator that led to complete panic and chaos as we fled for our lives. Sega-16: How did you turn the raw bird and alligator recordings into such convincing dinosaur sounds? How did you know what to look for? Brian Coburn: I created playable “dinosaur instruments” on my sampling keyboard out of library sounds and my original recordings, so that I was able to combine different sounds into an expressive and emotive language for each dinosaur species that was performed on the keyboard. Sega-16: Was there any ever input or restrictions from Universal regarding the game’s sound? How much freedom with the license were you given to work with? Brian Coburn: We got some examples from them which just functioned as guidelines. Sega-16: The use of QSound in Jurassic Park created some awesome effects if you had your Sega CD connected to a stereo system, yet few Sega CD titles used it. When and why was the decision made to include the technology, which was still quite new and unfamiliar to gamers at the time? Brian Coburn: We were very interested in 3D audio technologies at the time because we wanted to push the new capabilities we had with the Sega CD and use audio to help differentiate the brand in the marketplace. Sega-16: Were there any titles that got cancelled while you were working on them? Brian Coburn: Yes, several. After Jurassic Park, we had an offsite meeting where we presented game ideas for the studio going forward. I put a lot of effort into a project that was given the go-ahead by the team, but for political reasons it was shelved and we went forward with a very questionable concept. This led to the group losing status within Sega, the project getting cancelled, and everyone getting laid off. Sega-16: What was it like to work with Spencer Nilsen? He’s quite popular among Ecco the Dolphin fans. Brian Coburn: Spencer created some great music at Sega and I think Ecco was a great match for his composing style. I converted his original tunes for Ecco into Genesis format. I had to recreate all his studio synth timbres using the Genesis fm synthesizer. Sega-16: Though not a Mr. Big fan, I really like the “Swing time” theme from Spider-Man vs. the Kingpin on Sega CD. Tell us a bit about how the song came about. Brian Coburn: This was something Spencer Nilsen set up. I know that Mr Big, Spencer and the project producer had some meetings where they came up with thematic elements, and the final mix was recorded and produced at the Sega sound studio. Our thanks to Mr. Coburn for this interview.